I enjoyed reading the first two poetry bundles last year, so it was an easy decision whether to read the third and final bundle of the Women Are Some Kind Of Magic series. Where Amanda Lovelace‘s poetry might lack in style, complexity and elaboration, it outshines other poetry with its overwhelming and powerful emotions and strong messages. It’s actually combination of the simplicity of the words and the overpowering message they are able to communicate that turns her work into something special for me. I admire her for being able to speak this openly about the past and what happened to her. The bundles talk about the three stages she had to go through (the princess, the witch and finally the mermaid) to be able to start healing herself and keep working on the future. As someone who has been in an abusive relationship herself, it’s really easy to relate to her words and those who have had or are having a more recent experience will find comfort. What made The Mermaid’s Voice Returns In This One stand out from the others is that Amanda Lovelace mixes fantasy with reality this time, using not only poems but also short paragraphs with odes to famous stories by other authors. And that is not all: in the final part of this bundle you can find thirteen guest poems by other poetry writers with a similar topic mixed in between her work. An original touch and something I could really appreciate. I think the second bundle is still my favorite, but The Mermaid’s Voice Returns In This One is without doubt a wonderful addition. 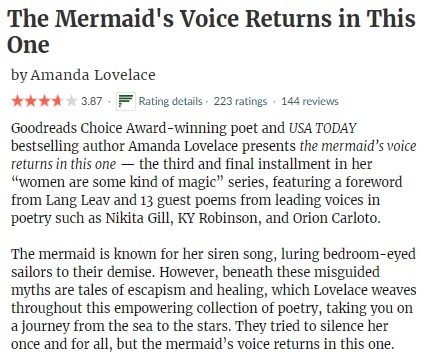 This entry was posted in 2019, 4 Star Rating, ARC, Book Reviews, Netgalley and tagged 4 star rating, abuse, amanda lovelace, arc, book review, feminism, Netgalley, poetry, published in 2019, series, the mermaid's voice returns in this one, women are some kind of magic by Yvo. Bookmark the permalink. great review sounds like a really interesting collection. I don’t read a lot of poetry, but I always like her work.